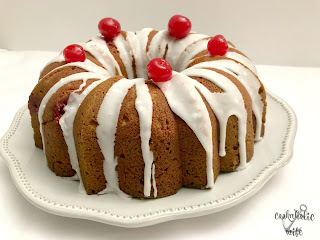 It’s been a while since I’ve participated in #BundtBakers, but when I saw the theme for March was cherries, I knew I had to participate. Tom loves cherries in baked goods, but for some reason doesn’t like fresh or frozen cherries. 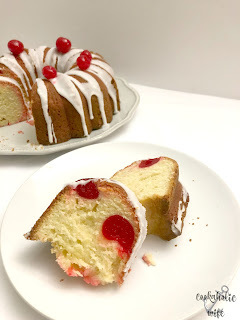 Since he’s the main person (aside from my coworkers) who eats the desserts I make, I wanted to find a cake that used either cherry filling or maraschino cherries instead so he’d like it. I think nearly everyone as a kid ordered a Shirley Temple when out at a restaurant with their parents, right? While the adults were ordering cocktails, you ordered a Shirley Temple because it was a drink with a name, making it much more special than something like a soda, tea or lemonade. Or at least, that’s how it went for me. 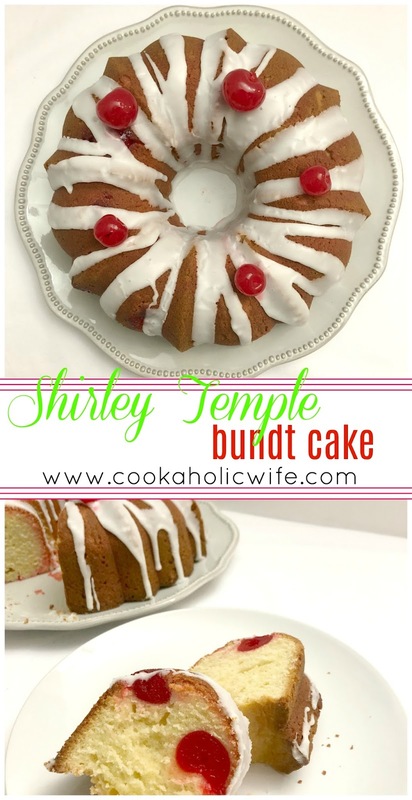 I found quite a few recipes for Shirley Temple cake but they all used boxed cake mix and I wanted to make the cake from scratch. Finally I found a recipe by Tastes of Lizzy T that didn’t use a cake mix and decided to alter that one a bit. This Shirley Temple Cake, made with 7-Up soda and maraschino cherries will bring back childhood memories of sipping on the classic drink. Preheat the oven to 325 degrees. 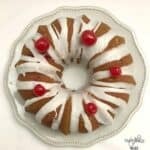 Spray a bundt pan with cooking spray or lightly butter and flour. In the bowl of a stand mixer, combine the butter and sugar and beat on medium speed until light and fluffy. Add in the applesauce and mix until combined. (If using eggs, add in one at a time until fully combined). With the mixer running on low speed, add in the flour ½ cup at a time. When all of the flour is incorporated, add in the lemon extract and lemon-lime soda. Fold ¾ of the cherries in by hand using a silicone spatula. Pour the cake batter into the prepared bundt pan. Bake for 1 ½ hours or until a toothpick inserted in the center comes out clean. 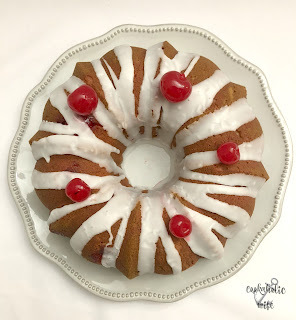 Let the cake cool in the bundt pan for 10 minutes, then poke holes into the cake with a toothpick or wooden skewer. Pour the reserved cherry juice over the cake, allowing it to soak in. Invert the cake on a wire rack and let cool completely. Prepare the glaze by whisking together the powdered sugar, lemon extract and water (or milk) until a thick, but pourable glaze is formed. When the cake has cooled completely, place the cake and wire rack on top of the prepared baking sheet and drizzle the glaze on top. Place remaining cherries on top. Let rest for 10-20 minutes or until the glaze has hardened. Transfer the cake to a serving plate and cut into slices. This cake smells heavenly. I’ve mentioned how I rarely even eat the sweets that I make anymore, but I couldn’t pass up trying a slice of this cake. It’s sweet and fluffy and absolutely perfect. The taste of the soda doesn’t come through, but the cherries are bursting with flavor and it’s not hard to think of the Shirley Temple drink when having a slice of this cake. Since my vegan coworker has started eating the desserts I make, I try to replace dairy ingredients with other baking alternatives, such as the applesauce for eggs and the water for milk. A Beautiful cake, looks great. Looks lovely! And no real cherries? Wow, Tom is my complete opposite! I remember have a Shirley Temple or two and making them for my girls. Your recipe sounds good and I love the pictures.